I'm still mainly shopping my own closet but I do like to look at adding a few key pieces to my wardrobe at the beginning of every season. I'm definitely looking forward to Spring and feeling colors and prints lately. This is the type of dress I could live in all Spring long for many years to come. Polka dots add a fresh whimsical touch to these versatile slip-on's. This graphic clutch is as fun as it is pretty. The asymmetric wraparound design of this ring is just so modern and chic. The diamonds are ethically sourced and it's affordable too. This biker jacket gets a feminine touch thanks to a lovely blush pink hue. Loving the message and the lustrous burgundy color of this Lingua Franca sweater. TBH I would probably live in pajamas if I could. These stylish pajama inspired pants are the next best thing. Love it all especially the jacket so chic have a lovely weekend. I love that APC dress, Rowena! That's a great versatile piece to add in the wardrobe for sure:) And yes to stylish pyjama pants! Have an awesome weekend, chingu. You always select lovely items! 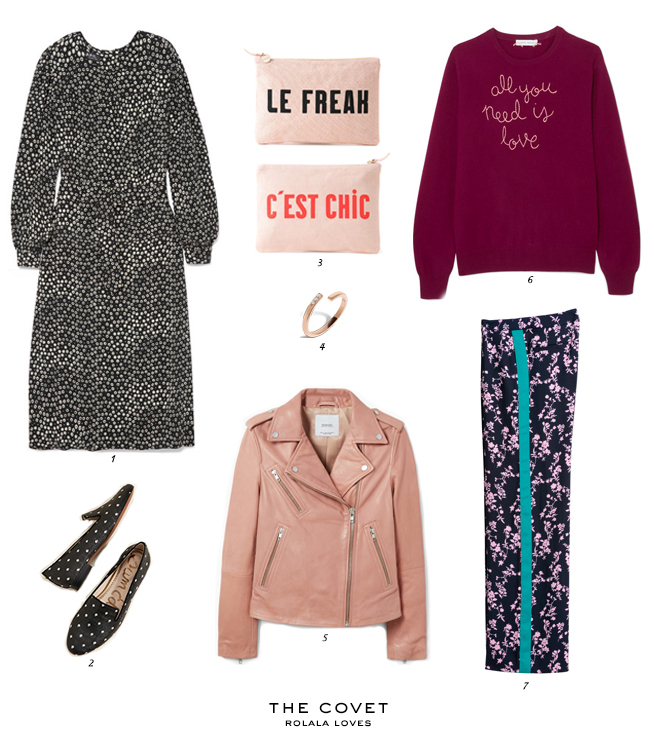 That midi dress (no.1) is so pretty and it would look just perfect with those dotted shoes (no.2). Those two clutches (no.3) are so cute! The diamond ring does have a lovely design, and it is great that it comes from an ethical source. The mango jacket is so pretty. I see blush pink items everywhere lately and they always look extra chic, soft and feminine. It is a lovely shade for sure. Lovely sweater and pants! That jacket is gorgeous, Rowena! I'm not usually a fan of blush but I will be more than happy to wear this. I need those Sam Edelman Jordy Loafers, and that wraparound ring. Ok Ok I’ll take the Mango Leather Biker Jacket. I really like the pink leather biker jacket. Ahh those are pajamas?! They are too fun! I also love statement clutches and can run around town with this. Love the pattern of the midi dress! need something long sleeved right now! The jacket is gorg but I adore the graphic clutches. They're super cute Rowena! That biker jacket is absolutely gorgeous! Love both the color & style.